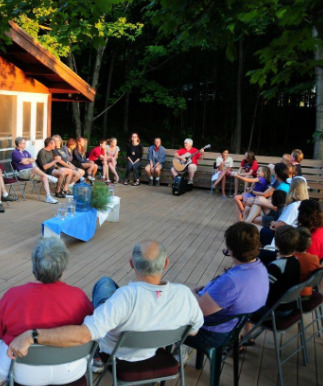 Periodically throughout the year, the church organizes weekend retreats, volunteer work trips, and other events that take us out into the world. Pilgrim Point offers the perfect opportunity for our youth members to get away from their parents. (Just kidding!) Outdoor activities, music, and crafts give them the chance to bond with each other, grow in their faith, and to experience the joys of summer camp. Every summer, in August, 60-90 members of our church head up to Alexandria, MN, for a weekend on Lake Ida. This weekend helps us connect as a community and reconnect with the beauty of God's creation. As we swim, canoe, worship around the campfire, watch the sunset, and listen to the loons and the waves on the shore, we have a chance to catch the sustaining breath of God's love and to play in the midst of God's joy!